The New York NGO Committee on Drugs (“NYNGOC”) announces the election of the new members to the Executive Committee. 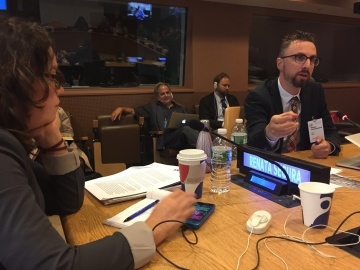 The mission of the CSTF is to serve as the official liaison between the United Nations and civil society in the preparatory process of and at the UNGASS. Applications are now open for speakers at the Special Session of the United Nations General Assembly (UNGASS) and will end the 7th of March. UNAIDS and the Permanent Missions of Colombia, Norway and Switzerland to the United Nations (UN) will be hosting a side event at UN headquarters in New York in the margins of the Informal Interactive Stakeholder Consultation (IISC). This consultation aims at assessing civil society work relating to Youth. Fill in the questionnaire before 31st December! The meeting highlighted some of the challenges engendered by the global drug control regime as well as ways forward that could inform the process of dialogue and negociations taking place in the run-up to the UNGASS 2016. The Civil Society Task Force will hold the 5th Civil Society hearing in preparation for the high level thematic debate in support of process towards the 2016 special session of the General Assembly on the world drug problem.